McCain and his wife arrived at the La Crosse Center under heavy security, including Secret Service protection and officers from the La Crosse Police Department and La Crosse County Sheriff’s Department. McCain stepped out of a silver Chevrolet Suburban at about 10 a.m. The motorcade — which followed a short route from the Radisson — included about 20 vehicles. 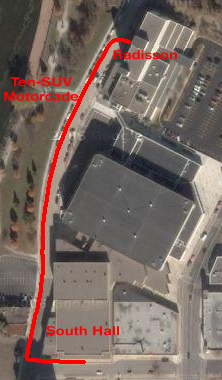 McCain entered the La Crosse Center on the far south end of the building, using a Jay Street entrance. Now it’s hard to see from this picture, but there is a walkway that leads from the Radisson’s second floor to the second floor of the La Crosse Center, and it’s not that hard to find your way to the South Hall from there. I’ve been on that path several times, so it shouldn’t be too hard for a security person to show him the way. The following map (it’s rotated a bit less than 90 degrees from the photo above) shows how to get from the walkway on the upper right to the stage at the left. The cluttered nature of the map makes the route look more difficult than it actually is. Total walking distance: two blocks. Do we really want a president who can’t walk two blocks, and would prefer to drive TWENTY SUVs instead? This entry was posted in Politics, Transportation. Bookmark the permalink.